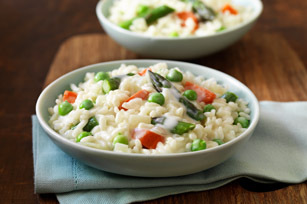 For a restaurant classic made at home, try our risotto recipe. Packed with spring vegetables and a creamy finish, this dish is sure to become a family favourite anytime of the year. Heat oil in large deep nonstick skillet on medium heat. Add carrots and onions; cook 5 to 7 min. or until onions are softened, stirring frequently and adding garlic for the last minute. Stir in rice; cook 1 min. Add wine; cook and stir 2 min. or until wine is absorbed. Add 1/2 cup broth; cook on medium-low heat 5 min. or until absorbed, stirring frequently. Repeat with remaining broth, cooking after each addition until broth is absorbed, and adding peas and asparagus to rice with the last addition of broth. Add cream cheese product and Parmesan; cook and stir 2 to 3 min. or until cream cheese is melted and risotto is heated through. Cool any leftovers, then refrigerate up to 3 days. Reheat in microwave just before serving. Garnish with 2 Tbsp. chopped fresh parsley or basil before serving. And/or serve with lemon wedges for squeezing over the risotto.